Pultrusion involves pulling a collection of fibers in the form of roving, tow , mat or fabric through a resin bath and then through a heated die to cure the resin. This produces a continuous prismatic section which is similar to the pultrusion die. The process is used with a variety of resin and fiber types to produce products ranging from simple round bar to complex architectural mouldings. A flying cut-off saw is programmed to cut the product to the desired length. 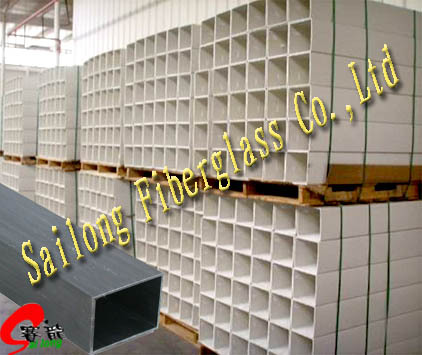 Since the predominant fiber direction is usually longitudinal this is reflected in the properties of the products which are usually strong and stiff in tension and bending with poor transverse properties. This limitation can be overcome by incorporating mats and fabrics with transverse reinforcement to provide a balance of properties.